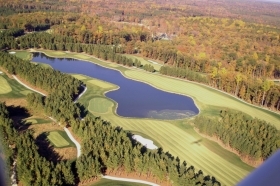 The site for the Mattaponi Springs Golf Club was selected to allow the development of a high quality course--with a challenging level of play--over a terrain of dramatically varying elevation and diverse landscapes. The course architects sculpted an interesting and enjoyable layout around the natural topography to reduce the impact of construction on environmentally sensitive areas. The course routing further preserved wetlands, plant and animal habitats and areas of historical significance to retain the natural and distinctive character of the site.